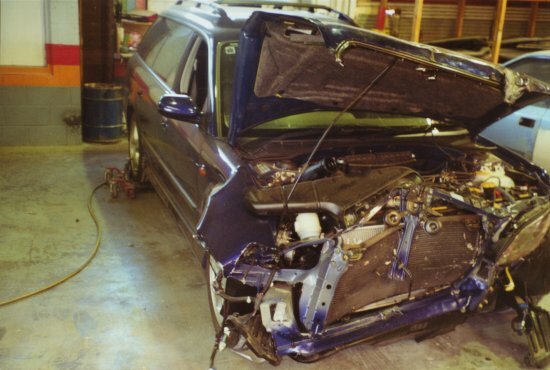 The remains of our car after it was crashed in May 2000. The oncoming car swiped across the front of our car taking out everything in front of the motor. Our car then spun and we were hit lightly in the rear by another car. Car was off the road for 3 months. The long delay was caused by supply problems on replacement engine mounts. They had to be ordered from Japan as there was no stock in Australia. The insurance people told me that by the time the repair costs and assessor costs were all paid the bill was over $30,000! After the repairs were complete, we were pretty happy with the car. The only niggles we had were to do with a couple of bits of loose carpet trim on the interior. Also the passenger side door lock fell into the door cavity one day - the lock wasn't actually damaged in the crash, but the door had been disassembled during the repairs and the lock was not refitted correctly. Power windows dont operate unless ignition is in "on" position. In my opinion they should work for a few minutes at least after ignition is switched off.